We take great pride in designing and manufacturing world-class albums, album pages and more. We promise to offer unique, easy-to-use, high quality and long-lasting products you can trust. Because the photo and scrapbooking industries aren't regulated, many companies make claims about their albums, papers, pens, adhesives and other supplies that can’t be substantiated. At CM, we stand behind our quality and test accordingly. 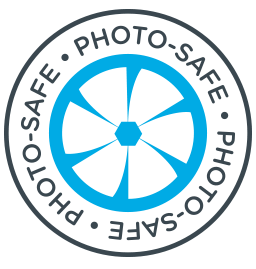 Wherever you see our Photo-Safe logo, it means that our products are designed and manufactured to be photo safe and permanent so your photos and memorabilia do not degrade over time. Because the photo and scrapbooking industries aren't regulated, many companies make claims about their albums, papers, pens, adhesives and other supplies that can’t be substantiated. At CM, we stand behind our quality and test accordingly. Designed to be photo safe and permanent so your photos and memorabilia won't drop off the page. Extreme temperature testing. The product must remain functional after being exposed to 6 weeks of 140°F (60°C), and 7 days of 0°F (-18°C). Bleed tests. Product must not bleed through material it has been adhered to after being exposed to 6 weeks of 140°F (60°C). Functionality and Cartridge Replacement tests to ensure: adhesive releases from the liner, tension is minimal from start to ﬁnish, take-up roll properly winds, minimal looping at nose and easy installation of the reﬁll. Designed and tested to be permanent, fade-proof, bleed-resistant and waterproof so they won't ever run and ruin your photos or surrounding pages. Our pens are perfect for left handers – they won’t smear. Buffered with calcium carbonate to combat the acids found in memorabilia and normal air pollution. We monitor papers’ brightness and ensure our paper stock does not contain post-consumer waste. All of our paper products are lignin-free to stop them from turning yellow and brittle over time. Sutherland rub test for printed papers and poly pocket pages. A weight is rubbed back and forth 100 times to ensure minimal color transfer and abrasion. Stitch strength to ensure the album pages stay intact. Crocking test to ensure negligible-to-no color transfer on the album material. Developed to be high quality, durable and long-lasting. We push the limit when it comes to testing our tools because we take great pride that they are the best on the market. We're vigilant about safety standards, always on the watch for sharp edges, choke hazards, lead or magnets. Our products are PVC and Cellulose Nitrate-free to ensure your photos remain safe. We also conduct shipping simulation tests to ensure the products reach your doorstep in great condition.